with the denomination's National Plan for Hispanic/Latino Ministries. Voices of the worldwide Methodist family came together in a Florida church on Sunday, April 29, to bless and celebrate 40 people being sent into the world as missionaries, deaconesses and home missioners to witness to God's love, mercy and justice. Representatives from Methodist churches in more than two dozen countries were present for the commissioning of 23 new missionaries and 17 deaconesses and home missioners of The United Methodist Church. The missionaries were from 11 countries. "Commissioning," according to an opening reading, "is a holy act in which the church, as sign and symbol of the Missionary God, sends forth people into the world." The service took place at Palma Ceia United Methodist Church during the 2012 meeting of the United Methodist General Conference, the law-making body of the church, which meets every four years to conduct church business. Palma Ceia is a 66-year-old, 1,500-member church with strong mission outreach. More than 500 persons attended, overflowing the sanctuary into a fellowship hall where a video link was set up. The Rev. Kevin M. James Sr., the church's pastor and host, said it was "wonderful to have the global church at Palma Ceia." People in 22 countries tuned in to the live stream on the Internet. Later in the evening of April 29, the newly commissioned mission personnel were enthusiastically welcomed by the General Conference at the Tampa Convention Center. Video and projected still photos underscored what Thomas Kemper, chief executive of the mission agency, termed "missionaries from everywhere to everywhere." Bishop Hope Morgan Ward of Mississippi, vice president of the board, led the conference delegates and friends in blessing the new missionaries, deaconesses and home missioners. Seventeen newly commissioned global missionaries will go to places as diverse as Senegal, Costa Rica, Argentina, Russia, Northern Ireland and Tanzania. There are some 220 global missionaries serving through the denomination's Board of Global Ministries. Deaconesses and home missioners, who are men, serve ministries of justice in the United States. Two people were commissioned as church and community workers, missionaries in economically marginalized U.S. communities. Four are new missionaries through the National Plan for Hispanic/Latino Ministries. The missionaries serve through the denomination's Board of Global Ministries; deaconesses and home missioners have a special relationship with the church through the Women's Division of the agency. At Palma Ceia, in a service both solemn and joyful, the new mission personnel confirmed a call to a lifetime of mission, "being led by the Spirit of God to engage in this work." They promised to pray, read the Bible, increase their skills and do their work "in sincerity and love," witnessing to the grace of God in Jesus Christ. Bishop Bruce R. Ough of West Ohio, president of the mission agency, led the service of commissioning. At the start of the service, Thomas Kemper and Harriett Jane Olson, head of the Women's Division, read a litany that attested to the importance of missionaries and deaconesses in Scripture and the Methodist tradition. The litany expressed trust "that these mission servants, being sent forth in the power of the Holy Spirit and the accompanying grace of God, will fulfill the sacred tasks entrusted to them. 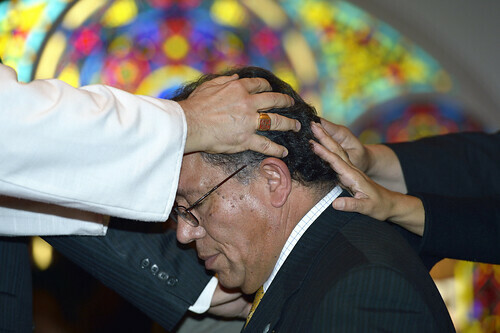 A prayer by Home Missioner Haniel Garibay of the Virginia Annual (regional) Conference summarized many of the situations in which those commissioned will serve, including affliction by hunger, natural disaster, war, injustices, pollution, and neglect. And, those who hunger "for the spiritual food of God's Word and love." Here is a full list of those commissioned, their home annual conferences, and their assignments. *Wright is a longtime reporter and a former communications staff member with the United Methodist Board of Global Ministries. News media contact: Tim Tanton, (813) 574-4837 in Tampa, Fla., through May 4; after May 4: (615) 742-5470 in Nashville, Tenn., or newsdesk@umcom.org.